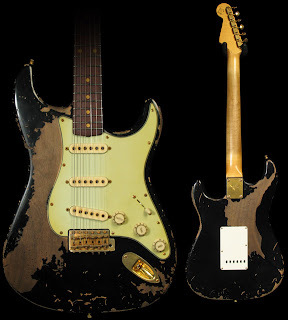 For a few years now Fender Custom shop has been building relic guitars that are new but look like they were tossed around a stage for 50 years. It's pretty sweet and while it might be a total poser move, I'd rather have a fresh guitar that looks beat up than an a guitar that was ACTUALLY beat up for reliability reasons. I'd have a hard time believing an old guitar that looks like the one above didn't have it's neck cracked at some point. It'd be a diffrent story if I had worn it in myself, but I guess that's a different story. The only problem with the custom shop relics are the price tag. $3,500 for a strat is a little hard to swallow, especially when you can get an early 70s vintage start for about the same price. To fix the price problem, fender started making some guitars that had "wear" painted right on. The quality was about as good as a T-shirt and you could spot the fake wear from the other side of guitar center. The latest Fender creation is the "Road Worn" series that is still trying to find some cheaper ground while looking reliced. These guitars and assembled and road worn in Mexico and while they look much better than the screen printed previous versions, the quality isn't right. It's a MIM strat at 1.5x the price with OK but not great looking relics. I got to play one earlier this week and like a lot of reviews I saw, the frets were pretty sharp. Nash guitars - About half the price of a custom shop guitar ($1700). Available at a bunch of places inclusing musictoyz.com. They make start, tele, esquire, and P bass relics. Used to do custom order but not anymore apparently. Rebel Relic - out of Amsterdam. About the same price (1400 Euro [$1775 by current exchange]). They do strat, tele, eqsuire and will do custom jobs too, including basses. Ebay - I found a coulpe guys on ebay that take stock guitars and do some work to relic them. They actually do a pretty good job. I also found sites selling reliced hardware. I'm still saving up and buying the /13 when I'm to my goal, so it's all just looking for now! I wonder if relic guitars will be a fad like buying jeans with holes?? Hmmmmmm. Aviom is a "personal monitoring system" a lot of churches use for their musicians. You can use them with wedge monitors, but I think most use them with in ears. The great thing about them is you can control the level of each instrument, on your own, by twisting knobs. Much better than yelling to the sound guy or making air traffic control signals during a song to let the sound guy know how he can adjust your monitor. It's also great with in ears because the mix is a lot more finicky when you can hear everything so clearly, you can get buy with a less than stellar mix in a wedge than in an in ear. So far Aviom has pretty much had this market to themselves... until now. RSS (by Rolland) has introduced the M-48 personal monitoring system. From the specs and what I've heard, it basically blows the Aviom out of the water. RSS makes a digital mixer called the V-Mixing System which is a pretty popular digital mixing board. The M-48, while it will work with any sound board, will specifically work really slick with the V-Mixing system. I'm not an expert on digital mixing boards, so I'll leave it at "it works well together" and let sound guys dig into it for them selves. How does this effect us as musicians? Instead of being limited to 16 channels like the Aviom, you can have 40 inputs and chose the 16 you want from the 40. With Aviom you can only send the same 16 to everyone, with the M-48 you and the drummer could have 16 completely different channels if you wanted. For instance, maybe the drummer wants each drum individually so he can mix them, but you just want a sub mix of all the drums (as one channel) that you can easily turn up or down with one twist. You can! Built in reverb for any channels you want. This is especially good for vocals and it's a classic studio trick to add extra reverb to a vocalists headphone mix while they sing, it makes the singer more confident. Built in limeter. This makes sure no noise gets over a certain volume - essential for in ears so you don't blow your eardrum if something feeds back or the sound guy accidentally has the gain way up one something during sound check. Built in room mic. Yeah, built in to the little module in front of you. That way you can hear people talk and get a feel for the room. No word on official pricing yet, but it's supposed to be "competitive with Aviom" in cost. The only bummer is that they waited so long! I think most churches that are going this way have already bought themselves an Aviom. If you have an Aviom it would be really, really hard to justify ditching the Aviom to buy this. I brought the amp in a few weeks ago to get the power and preamp tubes changed out and biased. During it's two week wait to get worked on, a couple friends of mine, who are also friends of Savage (where the amp was getting worked on) were in the shop, pointed out my amp in the waiting list, and suggested they take extra care and look it over. It's a good things they did because instead of just changing the tubes they gave the amp a look over and noticed one of the filter caps was about to burst and the others were dimpling and would need to be changed at some point. They also took a look at some of the mods my amp has and wanted to remove a mod and get it back to stock settings. A little history on the mod they wanted to remove, I was told it was a "half power" switch so to me that meant it would cut two of the power tubes from the circuit and make the 100W amp a 50W amp. I had tried it on the "half power" mode expecting to get more tube amp tone at the same volume, but that was never the case. It always sounded awful so I just never used it. Back to savage, they found out this switch wasn't cutting tubes, it was cutting half of the main preamp tube. ?????? So it was the dumbest mode ever. It essentially was just cutting preamp gain and therefore cutting volume... kind of. That explains why it sounded bad. On top of that, when the switch was up - "normal" it was STILL changing some values in the preamp stage. They called to talk about the changes and asked me what I liked and didn't like about the amp. I said I really liked it as a warm clean amp but never liked the overdrive. 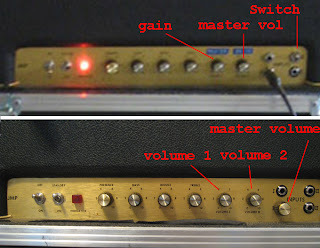 I always assumed it was just because amps back then sounded thin over-driven. They said the OD didn't sound like it should for the amp and they thought removing the switch would make it sound much better. I gave them the go ahead to change all the filter caps, remove the switch, clean everything, and change all the tubes. A few days later they called to say it was all done and they were excited about how it sounded. They've been making a 100W prototype and had been A/B/C-ing my amp, theirs, and a Hiwatt to hear the differences and really liked the sound of mine. I went in to play it and dang does it sound nice! The clean channel is noticeably better but with the gain cranked it's a completely different amp than before! It's the Marshall balls-to-the-wall stuff's falling off the shelf rock n' roll tone!!! And not the JCM800 or 900 tone, it's the classic AC/DC, Hendrix, The Who tone. Nummy. When they were changing the preamp stage back to stock they opened up a plexi super bass they have at the shop and made it identical. Sorry the top on is so blurry, I didn't have a hi-res photo on my computer. It's nice having the use of both channels again. I like the bright channel better but now I can jump them and blend the normal channel in if I want. They also told me something about the master volume that makes perfect sense, but I had never thought of it - if I dime the master volume it's essentially back to stock and volume 1 and volume 2 control everything like they would have stock. Why didn't I think of that? !